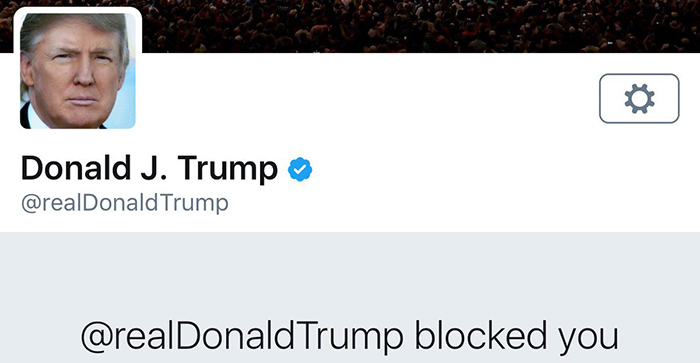 A US court has ruled the country’s controversial president cannot block someone on Twitter “in response to the political views that person has expressed”. To do so, District Judge Naomi Reice Buchwald said, would be a violation of the right to free speech. Donald Trump has 52 million followers on Twitter and, since his inauguration, uses the social media platform to communicate and interact with the public about his administration. The case was brought by the Knight First Amendment Institute at Columbia University and seven Twitter users whose accounts had been blocked. These claimants cannot view Trumps tweets, reply to them or see the comments thread underneath them. They can view the former reality TV star’s tweets when not logged into Twitter or when logged into a different, unblocked account. The claimants argued their First Amendment (free speech) rights “have been and will continue to be encumbered and the ability to communicate has been and will be limited because of each individual plaintiff’s personal ownership of a Twitter account that was blocked”. Giving her ruling in Manhattan, the federal judge said that Trump’s Twitter account is a “designated public forum” and that the “viewpoint-based exclusion of the individual plaintiffs from that designated public forum is proscribed by the First Amendment and cannot be justified by the President’s personal First Amendment interests”. Buchwald said “we must assume” Trump and the White House’s social media director, Daniel Scavino, who helps run the account, “will remedy the blocking we have held to be unconstitutional”, and suggested the pair mute the president’s critics instead. The Justice Department has 60 days to appeal the ruling. I’m not sure why you’d go to court to find out this orange loon’s thoughts. MAKE MEXICO PAY FOR IT! You have either read or mis-read the Judge’s decision. She sad because you (Trump) use your twitter feed as a public forum, then to block people that engage with you via the forum, because they don’t share your views, or provide alternate commentary is unconstitutional. It is unconstitutional because it does block free speech from those that dissent. 1. All of Twitter is a public forum. 2. I take your point that there is a difference between the president and regular citizen but there is a huge swathe of grey between. 3. What about local politicians, what about companies, what about pop stars? I take your point on local politicians, it will depend how they are using their twitter account. Companies, nah, in my view they are private corporations, as long as the person/people aren’t breaking the law, then they will have to grin and bear it and/or be able to block them. He did not read the judgment. I doubt anyone commenting here have (including me). Remember unlike the UK and Europe, the USA has virtually absolute free speech. This is why far-right rallies that would amount to incitement to racial hatred in the UK happen in the USA all the time and the police don’t stop them. Childish yes, but not unconstitutional. This case is a waste of money, time and effort. Where are they finding these judges? Freedom of speech is about being free to say what you want, we’ve always had the right not to listen or not to speak to certain people.